Do you have an iPhone but often wish you also had an Android device for certain things? Well, Eye wants to take care of that, by adding an Android smartphone to an iPhone case. 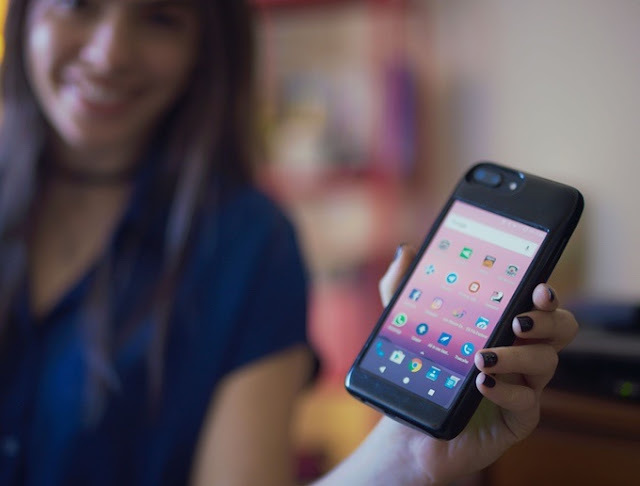 We've seen a few projects that add a secondary screen on a smartphone back in the past (some manufacturers even turned that into their "thing", like the Yotaphone), but this Eye on the Kickstarter takes the concept even further by applying a full-featured smartphone on an iPhone cover. The features seem interesting enough, with a 5 "AMOLED Full HD screen, dual SIM, 2800mAh battery (with wireless charging), Android 7.1, NFC, IR, and the promise of some kind of integration with the iPhone as it is supposed to achieve Use the rear camera of the iPhone as a camera for the Android device. It's a project that looks great and, better yet, it comes with a great starting price of just $95 - a price that unfortunately puts this project in the "too good to be true" category." Even considering that this smartphone does not have some components - like the cameras - it seems to me that it simply is to cheap to be feasible (even more considering it's using an AMOLED screen and such). In addition, there are a few other suspicious buts, like no reference to the CPU that will be used, nor the RAM amount, quite important things - which aren't mentioned while a metal plate to allow the magnetic docking in a car gets extra honors. I sincerely hope to be wrong and that this Eye will become reality and be all that it promises, but unfortunately, at this time, I have serious doubts that it will come to fruition (by August this year, as it is announced ).